A bruise or scratch on a fashioned diamond. A very bright and reflective lustre typically displayed by diamond. From the Greek word ‘adamas’ meaning unconquerable or indestructible (See ‘lustre’). A rectangular shaped step cut. Minute, hair like feathers extending into a polished stone from the girdle caused in the fashioning process. A surface imperfection on a fashioned diamond e.g. nick, scratch, abrasion. The return of light through the crown facets and surface of a gem, resulting from light reflecting from the pavilion facets. Collective name for diamond cuts whose lowed facets radiate from the centre of the stone towards the girdle, the most common of which is the round cut. The process of shaping the rough stone into its eventual polished shape along the girdle. A frosted surface effect on a stone due to overheating during the polishing stage or when the diamond is mounted and the mount is being repaired. Old term used to describe diamonds with a distinct yellow tint. Standard weight unit for gemstones; 1 carat = 0.20 grams. Document provided by an accredited laboratory,such as AnchorCert, stipulating the stone’s weight, colour, clarity, cut and proportions. A stone’s relative freedom from inclusions and imperfections. Expressed in a fixed grading scale. cutting or treatment. They affect the diamond’s clarity grade when viewed through 10x magnification. A group of tiny inclusions to give a clouded appearance. When a gemstone is coated on the pavilion, girdle or entirely to improve or change the overall colour of the stone. The part of the stone located above the girdle. An impurity within a stone with a geometric, crystal-like shape. The small facet at the point of the pavilion. Manmade gem. Zirconium Oxide stabilised in the cubic system. The most common diamond imitation. 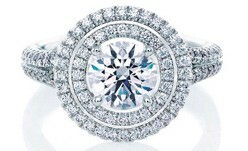 The cut refers to the diamond’s overall shape. It also refers to the proportions and finish to a polished diamond. A synthetic diamond produced by a process of chemical vapour deposition. A carbon based mineral created under extreme pressure and temperature. Diamond is the hardest of all known substances and exists in a variety of colours ranging from white to fancy colours. A composite gemstone consisting of two parts of the same or different materials joined together. A combination of hardness, toughness and stability within a gemstone. Rectangular or square step cut with diagonally cut corners. Artificial alteration of the appearance and properties of gem material, in order to improve its appearance, stability and sale ability. Any facet added to the stone which is in excess of the facets normally required to complete the polishing. Usually found along the girdle to remove any imperfections. A rare naturally coloured diamond other than white. Can be yellow, green, pink, blue, red or orange. Any other shape besides the round brilliant cut. The entire process of manufacturing, i.e.designing, cleaving, sawing, bruting and polishing. A break or fracture in the stone which maybe internal or surface reaching. Flashes of the different spectral colours seenin a diamond and other gemstones as a resultof dispersion. When a diamond’s pavilion is too shallow and as a result a circular reflection of the girdle is seen through the table. Luminescence occasionally emitted from diamonds when exposed to white light, ultraviolet light or x-rays. Carat, Cut, Colour and Clarity: the four factors determining the quality/value of a diamond. A term used to describe the chipping or breaking of a stone along a direction other than cleavage plane. Clarity enhancing treatment. High refractive index glass is used to fill in surface reaching fractures. This treatment is not permanent and can be damaged by heat, acid and ultrasonic cleaning. Mineral or organic material with sufficient beauty, rarity and durability to be set into jewellery. Gem gravels are mined from certain alluvial deposits which are, or once were, river beds or lake beds. The edge located between the pavilion and the crown which travels around the entire stone. Generic term used in the diamond business to refer to rough and polished diamonds. Weight unit equivalent to 0.25 carats. Irregularities in the crystal structure of a stone which show up as faint lines.As these travel throughout the stone they may be internal or external. A stone’s resistance to wear and scratching, measured on Mohs’ hardness scale. Diamond being 10 which is the hardest on the scale. Modified brilliant cut with a heart-shaped girdle outline. Diamonds that are synthesised by high pressure and high temperature. (High Pressure High Temperature) A method applied to diamonds to improve, remove or change colour. Natural or artificial material that is used to imitate the effects, colour and appearance of other gem materials without possessing their chemical and physical properties. Non-gem quality diamonds that are only suitable for industrial use (abrasive drills etc.). Imperfections located within the stone. The reflection of a feature within a stone. Diamonds which are artificially coloured by a bombardment of the atomic structure with radiation. An isotropic material exhibits the same optical properties in all directions through the material. Diamond is isotropic. Type of igneous diamond-bearing rock. Also known as yellow ground and blue ground. A type of igneous diamond-bearing rock rich in magnesium. Using a laser to fashion the diamond’s eventual shape, allowing cuts across the growth planes, thus permitting odd shapes such as letters, horse heads etc. Treatment often used to reduce the visual impact of dark inclusions. Tiny drill holes are drilled down to the dark inclusion. The dark inclusion can be bleached out by acid to make them lighter. This is a permanent treatment. Using a laser to engrave identifying text or numerals,most commonly found on the girdle. Instrument used to measure the precise dimensions of a mounted or unmounted stone. Small magnifying glass used in the diamond trade to examine diamonds. Magnification power varies. 10x magnification is specifically used for diamond grading. Triangular shaped facets, located on the pavilion. Four sided facets of which there are eight meeting at the centre to form the culet. The appearance of a material’s surface in reflected light. Determined by the refractive index and polish, or surface condition. The quality of the symmetry and finish of a polished stone. Symmetrical boat shaped brilliant cut with pointed ends. A set of polished stones which have been colour graded to a certain standard by an accredited laboratory for the purpose of colour grading polished diamonds. Small diamonds of mixed sizes. Both rough and polished. Scale of relative hardness of minerals. The scale runs from 1 to 10. Diamond being the hardest at 10 on the Mohs’ scale. Silicon carbide. Manmade for use in jewellery. Similar in appearance to diamond, may be used as a diamond imitation. Original surface on the rough diamond crystal left on the polished stone. When the pavilion is too deep, light escapes from the pavilion leaving a dark circle effect under the table. A trade term used to describe any variety of glass gemstone imitation. Folded sheets of paper used to contain polished or rough diamonds. The section of the diamond found below the girdle. Asymmetrical cut with one pointed and one rounded end with a pear-shaped girdle. Weight unit. One point is 1/100 of a Carat. The relative smoothness of a surface. Rough stones that have been cut and polished as opposed to rough. Small parallel indentations left on facets during the polishing process. Modified brilliant cut with a square or rectangular girdle outline. The relative symmetry of angles and measurements on a polished diamond. Term used to describe the overall colour, clarity and cut attributes of a stone. Used in various applications. Used to detect HPHT treatments in diamonds. The bouncing back of light when it strikes an external or internal facet on a polished diamond. Polished or rough diamond of very poor quality. Gem in its natural form before it undergoes any manufacturing process. Most common style of cut for diamonds. A standard round brilliant consists of 57 facets. If there is a culet, 58 facets. Flat cast iron wheel upon which diamonds are polished. A diamond in which the crown and pavilion are shallow. The outline of a diamond when viewed perpendicular to the table facet. Round stainless steel plates with perforations which correspond to specified diamond diameters.A quick way to sort small diamonds by size. Process of separating rough or polished diamonds into colour, clarity, carat and cut grades. A triangular facet located on the crown of a brilliant cut next to the table, of which there are eight. The accuracy with which the diamond is polished to its perfect proportions. A manmade diamond having the same physical, optical and chemical properties as a natural diamond. Large facet in the centre of the crown on a polished diamond. The ability of a material to conduct heat. This principal is used for diamond testers. The ability of a material to resist the development of fractures through the material. When a material only allows some light to pass through. When a material allows most light to pass through. Diamonds can be treated, other than by cutting, polishing and cleaning, to change the diamonds appearance by coating, filling, heating, irradiation, or any other physical or chemical treatment. Lower end of the light spectrum invisible to the human eye. Ultraviolet light produces fluorescent effects in some materials, which may be an aid to identification or detection. Triangular facets located on the lower part of the crown main facet, right above the girdle. A misalignment of the crown and pavilion facets.As a result the girdle is not parallel with the table. Weight is measured in carats, subdivided into points. A well proportioned polished diamond with a good finish. A term to describe goods that are D - H colour. The total carat weight obtained after polishing from the original rough.